You will regret reading this. It’s disgusting. If you don’t like it, you may blame Fig’s aunt. (I won’t link to her in case that’s weird.) She requested a new post. I was going to write one anyway, but then I started to feel gross, so I changed my mind, but then I changed it back again. There is a very small chance I am dying. If you don’t hear from me in a week, you may assume I am dead and move on to greener blog pastures. A straggly band of loners. 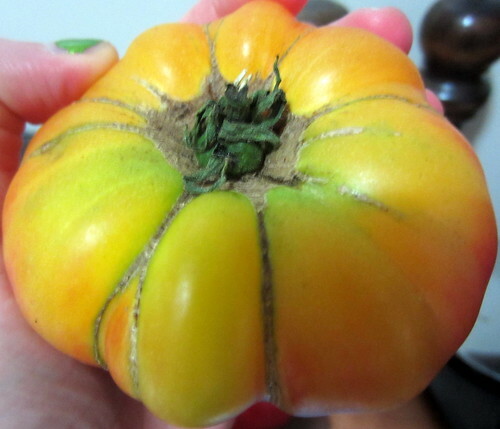 The roots of tomato disease are already visible. I don’t know how to pick good tomatoes, because in my grocery-store experience hard tomatoes will become mealy and will never have any taste, but soft tomatoes will be mealy and gooey and won’t have any taste. And there was a big sign over these heirlooms that said “Do not squeeze.” So I couldn’t decide if the less-firm ones were just more ripe and tastely (not tasteful… oh, flavorful) or if they were just going to deteriorate immediately, or if, alternatively, the more firm ones just wouldn’t have any taste because they never ripened. I am kind of dumb, probably. I trust this tomato the most out of all of them. 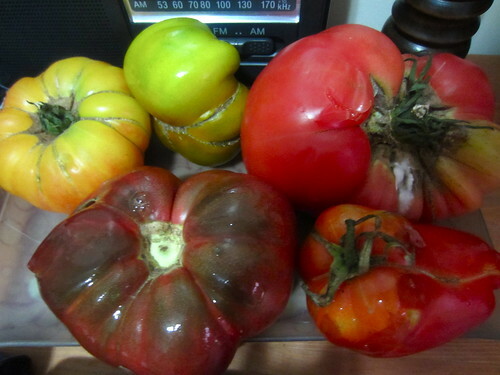 But anyway, I decided to pick my tomatoes based on which ones looked the most interesting; which ones I wanted to share my kitchen and life with, if you will. I ended up with five misfits of various color, size, and squashiness. I was very pleased. ALSO, THEY COST $12. I WAS LESS PLEASED AFTER THAT. 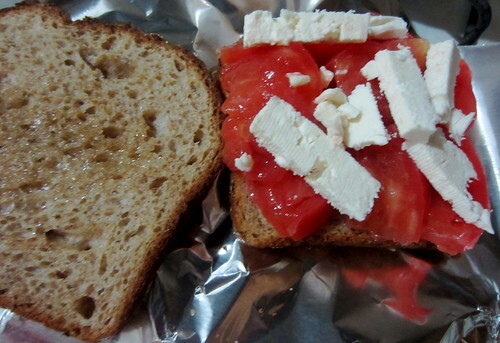 This morning I was planning my lunch, and decided to make a tomato sandwich with feta. I put some bread in to toast and picked up the largest tomato, since it seemed to be heading quickly toward death and I wanted to use it up. THEN IT PEED ALL OVER MY KITCHEN TABLE. I can’t think of any other way to express this. It had been sitting in a puddle of its own juice, and when I picked it up, more juice went everywhere. But it was nasty juice, not tomato juice. I don’t know what it was. I don’t want to think about it anymore. I cleaned up the juice and dissected the tomato; there were a lot of bits to be cut away, but most of it smelled good and tomatoey (although not viney, which is my favorite smell in the world). I drizzled some olive oil on the bread, and by that I mean I put a lot of olive oil in the middle and then failed to spread it around, and piled the tomato bits on top, and layed some feta on top. If you didn’t know the backstory, you would totally eat this. Then later, because that’s not enough for lunch, I had some olive-tapenade hummus, and my stomach was like, OH MY GOD, STOP FEEDING THAT TO ME. I was like, why, it’s just hummus. But I had to cease because I knew it could punish me severely if it wanted to. Now I have a general feeling of ickiness and am having white pasta for dinner, but there’s not enough of it, so I don’t know what else to eat. Blah. In other news, I am going to cook the lentils over extremely high heat and freeze them in small portions, so later on I can eat them over bread or rice. I was going to do that tonight, but my stomach was like, I am not dealing with that. P.S. You should know that I wrote a lot more gross things in this post and then deleted them. You’re welcome. P.P.S. I just took this opportunity to change my life. I have thrown away most of what was in my freezer. P.P.P.S. I just threw away the rest of the lentils. LIFE IS GETTING CRAZY, GUYS. This entry was posted in Dinner, Lunch, Pasta, Self, Vegetables, Vegetarian and tagged bread, ewwwwwwwwwwwwww, farmers' markets, horrible advice, never do this, sourdough, tomatoes. Bookmark the permalink. Congrats on the freezer purge. I would recommend writing down everything you threw out (that you can remember) so you know not to stock up on/make extra of those items, as they tend to waste away. ok, i’ll stop saving blueberry ice cream and quinoa curry. and bags of broccoli stems. and herbs (or at least i should use them within a year).